Womens Size 12 Shoes from Jimmy Choo, Nine West, Gucci, and many more designers. Being tall no longer means being unfashionable, and shoes are no exception. The same styles you see other women wearing, by many of the top designers, are now available online in extra large womens shoes and extra wide womens shoes. One of the top online shoe retailers has almost 8,000 pairs (that's correct!) 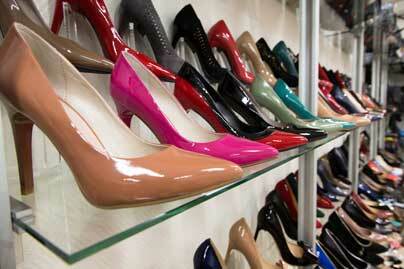 of womens shoes in sizes 12, 13, 14, and 15. You can refine your search for types of shoes, brand, etc. using the menu on the left side of the page. Shop Macy's for womens size 12, 13, and 14 sandals, pumps, flats, mules, wedges, and sneakers from Aerosoles, Bella Vita, Clarks, Easy Street, Jessica Simpson, Lucky Brand, Naturalizer, Nine West, Ugg, and more! Nordstrom features over 2,000 pairs of name brand and designer womens shoes in sizes 12, 13, 14, and up. Featuring Tory Burch, Sam Edelman, TOMS, Jimmy Choo, Gucci, Givenchy, Christian Louboutin, Manolo Blahnik, and more.